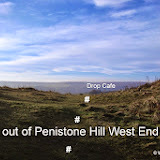 BM - 12km/300m from Penistone Hill Country Park, near Haworth, W Yorks (GR 025364). We are taking a leaf out of the Junior Rat Run races again by having senior fancy dress prizes with the theme being Halloween of course. So if there are any witches, horrors or monsters out there who fancy a run, a prize could await you. Autumn and the great weather it brings will soon be on its way and that means the challenge of Haworth Moor will be calling you, after all you know you love Penistone Hill and the 'pleasure' it brings. 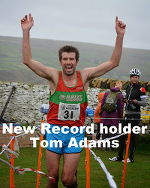 Last year Ilkley Harrier Tom Adams won the race in 39:26 taking two minutes off Olympic & now Commonwealth Triathlon champion Alistair Brownlee's record of 41:28 with Simon Bailey in second. Rachel Chambers of Sale Harriers won the ladies in 50:49 from Lindsey Brindle, but the record holder is still Jo Waites of Calder Valley with 48:29 set in 2006. But 3 entries for the 2014 Auld Lang Syne race will be on offer to Withins runners in the free prize draw, you must be at the Old Sun Hotel prizegiving to win. It's Rat Run time kids so let's see you trying to follow in the foot steps of World, Olympic & now Commonwealth Triathlon champion Alistair Brownlee by winning a Quarry Run which he did in 2001. Don't worry too much if you're not on top form, we remember when World, Olympic Bronze & Commonwealth Silver medallist Jonathan Brownlee ran in the BU12 race where he finished fourth and look at him now. Read all about the Curly Wurly Rat Runs in the Spring 2009 Fellrunner magazine article here.